Japanese food, where do you get really good ones? 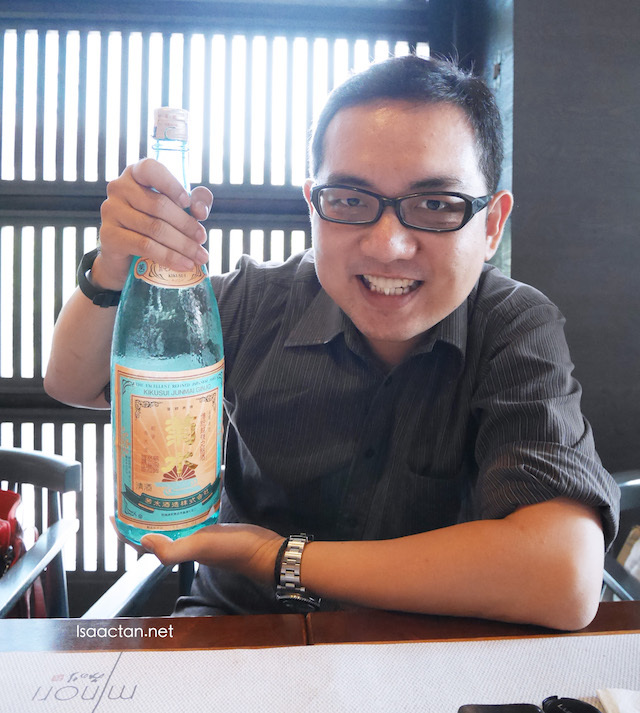 MINORI Japanese Restaurant Fine Dining @The Royal Chulan Damansara recently held a review session for bloggers, for us to try out Japanese Master Chef Takahiro's Omakase Set. A luxurious set indeed, do check out what we had below. If you're looking for an authentic Japanese dining experience, look no further than Minori Japanese restaurant. It has a zen-like Japanese decor, located inside The Royal Chulan Damansara Hotel at Mutiara Damansara. 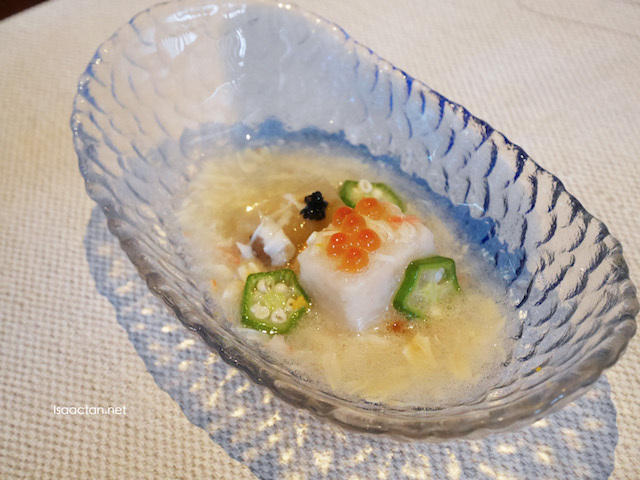 That afternoon we were invited to savour the Omakase Set prepared by Chef Takahiro, starting with the appetiser, Yum Tofu & Grilled Seasonal Eggplant with Crab Sauce, Ginger Flavour & Mountain Caviar. When we were presented with the Yum Tofu & Grilled Seasonal Eggplant with Crab Sauce, Ginger Flavour & Mountain Caviar, I initially felt it looked rather normal. But when told of the ingredients used, I began to appreciate what went into my mouth with each spoonful of this dish. It actually tasted a lot better than how its portrayed, thanks to the crab sauce, ginger and caviar. Love how silky smooth the tofu tasted. Drink some soup, we were told. 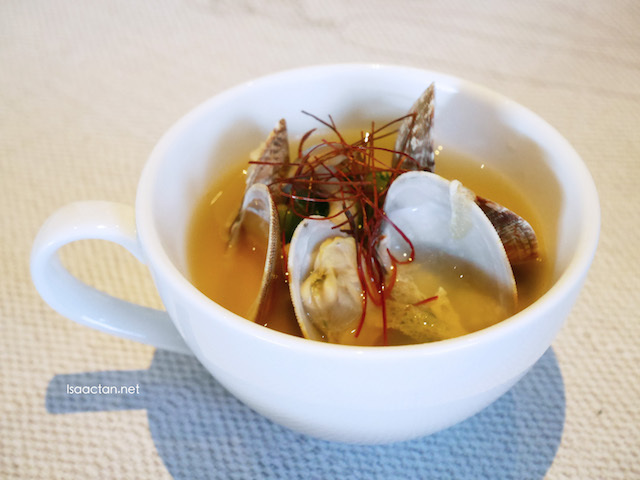 Not just your usual run of the mill soup, but we had MINORI's Clam Soup which is made up of steamed eggs with Ohitashi Organic Wasabi Leaf and Asari Shell, in Yuzu Orange Flavour. I got a taste of the original taste of the clam, and while drinking the soup, I found delectable chawanmushi at the base. Not too salty, very savoury, this is pretty good stuff! Fancy some steamed beef tongue sir? 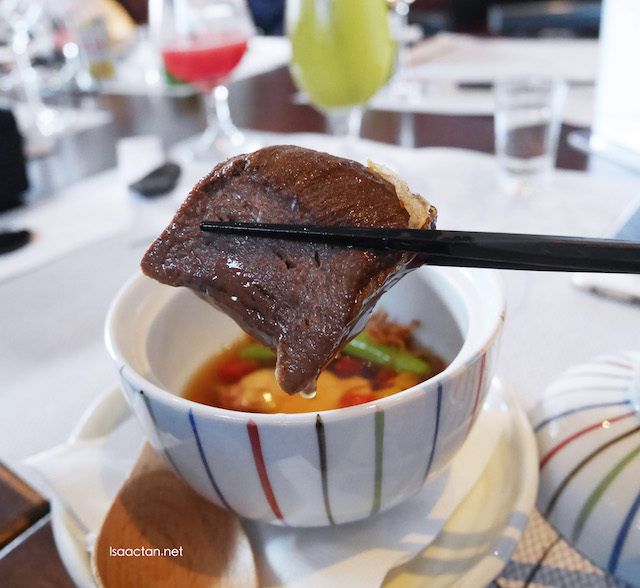 Not my cup of tea, but I was really intrigued with how soft they managed to make the beef tongue inside the Nimono - Tender Steamed Beef Tongue With Special Sauce dish. So tender, I love the sauce that came with this dish, together with the accompanied condiments. I must say, the chef is really skilful to be able to whip up this dish. Grilled White Miso marinated Butter Fish "Saikyo Yaki"
Up next, my favourite dish that afternoon. 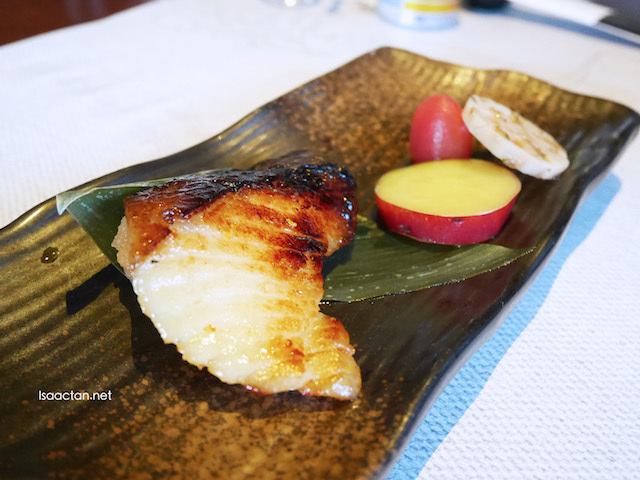 Coming from a non-seafood person like myself, this is really saying something, as we were served with the very delicious Grilled White Miso marinated Butter Fish "Saikyo Yaki". 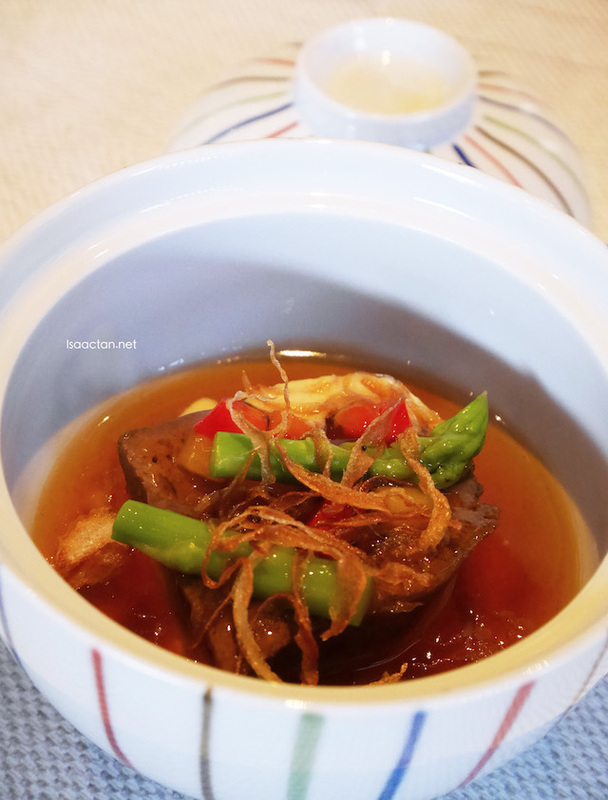 Loved how the marinated fish tasted so flaky and tender, doused in this sweet sauce with a caramelised skin. Paired with Vinegar Tomato, Wasabi Lotus Root and sweet potatoes, I wished I had another serving of this dish. I never knew a porridge dish can be so tasty. 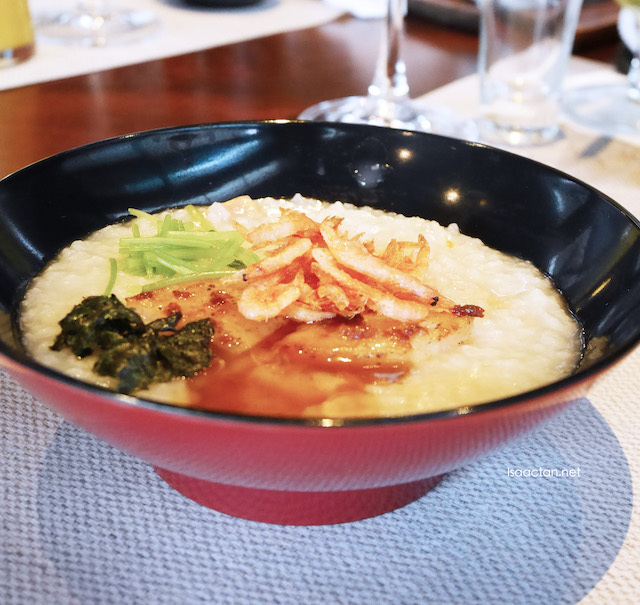 We were treated to the Scallop Porridge Minori Style With Fried Cherry Blossom Prawn, tasty yet not too thick. Using dried and fresh scallop, it's naturally sweet, not too heavy too. For the health conscious, this is the perfect dish for you. A meal isn't complete without some sweet dessert. 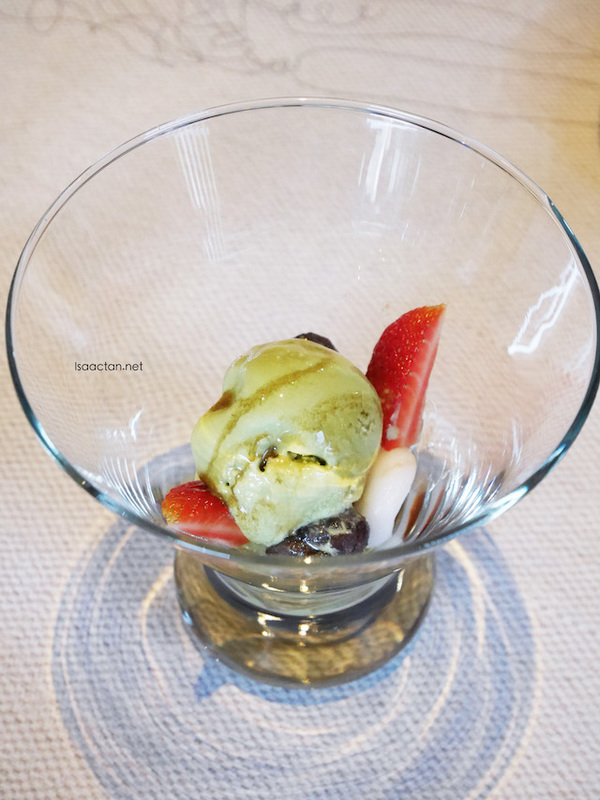 For this omakase meal, the chef prepared a glass of Warabi Mochi and Green Tea Parfait. The dessert has these strwaberries in it, together with adzuki beans, paired with chewy warabi mochi at the bottom. Not bad, perfect ending to a nice meal out at MINORI. 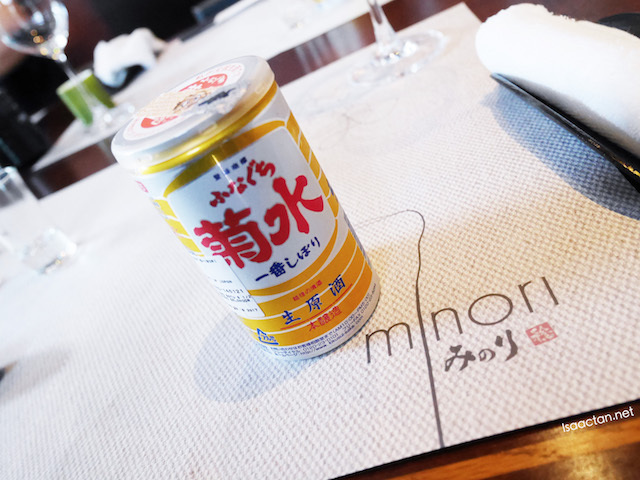 MINORI Japanese Restaurant Fine Dining @ The Royal Chulan Damansara currently have an on-going promotion of up to 50% DISCOUNT for Omakase sets with a minimum spend of RM500 per pax for Maybank World MasterCard & Maybank Visa Infinite cardholders. For all Maybank MasterCard & Visa Cards holders, you will get 20% Omakase & Chef's Monthly Recommendation Special Menu as we, so what are you waiting for? wahhhh...Issac, this is really fine dining... a bit of this and that... my girl will love these! Wow! I like japanese food.. So does my eldest son.. Probably gonna go there one day to try it out..
Wow, for once I prefer the photos of the food rather than the dessert. Scallop porridge is my favourite!!! the food lokks so yummy and delicious!!! I like japanese food!! look delicious Japanese food. wish to try their sweet dessert too! The Yum Tofu & Grilled Seasonal Eggplant with Crab Sauce, Ginger Flavour & Mountain Caviar is my favourite! Food looks really mouthwatering and so does the dessert. Nice food photos. Bookmarking this place! OMG, the Japanese food is so mouth-watering. When come to Japanese food, I really love it. The Grilled White Miso marinated Butter Fish "Saikyo Yaki" is so tempting , the grilled fish maybe i need refill ...ahaha..
never a porridge person, but the dish does look very attractive! would love to try some day. I like their sashimi, its so fresh. i love the butter fish dish!! it looks so delicious, can i have a bite? Japanese fine dinning, sound exciting. I loves this Yum Tofu & Grilled Seasonal Eggplant with Crab Sauce, Ginger Flavour & Mountain Caviar. will visit them soon.